Hello, it’s Caro Lamont from Sparkle Abbey's Pampered Pets mysteries and it’s my turn to chat with y’all today. In preparation for the holiday season, I’ve been going through a shoebox where I’ve collected some old family recipes. 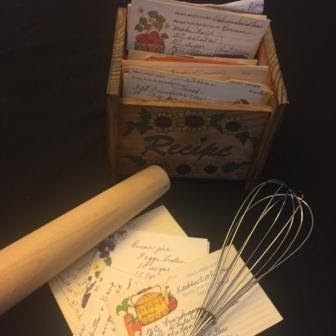 I love the idea that these recipes were used by my Grandma Tillie or even perhaps shared with her by her mother or grandmother. The Montgomery side of the family is known for putting on a big feed at the holidays and I’m sure many of these were used through the years. I came across a recipe for Texas Strawberry Pie that my cousin Mel and I used to help Grandma Tillie make. I remember her sending us out to pick the fresh strawberries. I also remember us eating nearly as many as we brought back to the house. Grandma Tillie never said a thing, but I’m sure our red-stained lips gave us away. There are also many yummy sounding dishes I have no memory of but that I’m itching to try. I’m pretty sure I’ve gained a couple of pounds just reading the ingredients for some of them. Though I love to cook, I have to admit I don't do it as frequently as I'd like. I get so busy with my pet therapy work and other things that I often just grab something on my way out. Add to that, I live alone, so I’ve gotten out of the habit of cooking for anyone else. Still, I like the connection to family and the reminder of meals together that some of these recipes bring to mind so I want to preserve them. Some are jotted on pieces of paper and others are on fancy little file cards. No consistency and no system to organize them so I’m not sure how I’m going to keep them straight. I’m thinking maybe I should simply scan them and save them to a file on my computer. Or I’ve seen online some adorable recipe boxes and notebooks. What do you suggest? How do you keep recipes you want to save? By the way, in case you’d like to try it, I’m including Grandma Tillie’s Texas Strawberry Pie recipe below. It's really simple and so tasty! I'm going to give it a try myself this weekend. In a medium saucepan, combine 1 ¼ cup of sugar and 2 tablespoons of cornstarch. Add 1 ¼ cup of water and 2 tablespoons of lemon juice. Bring the mixture to a boil and then reduce the heat and cook it on low until it begins to get thick. Stir in a package of strawberry jello until it’s dissolved and then let the mixture cool. Once it’s cooled stir in a quart of fresh strawberries that have been cleaned and sliced, and then poor it all into a baked pie shell. It’s best if you let the pie cool for a few hours so it can set up. Grandma Tillie always liked to serve it with whipped cream. Real whipped cream, of course, none of that fake stuff. Don't forget to share your advice in the comments on how I should preserve these family recipes. I'd love to hear your ideas! Sparkle Abbey is the pseudonym of two mystery authors (Mary Lee Woods and Anita Carter). They are friends and neighbors as well as co-writers of the Pampered Pets Mystery Series. The pen name was created by combining the names of their rescue pets--Sparkle (Mary Lee's cat) and Abbey (Anita's dog). The latest book in the Pampered Pets series is Raiders of the Lost Bark. I keep the recipes I want to save my n plastic sleeves in three ring binders. I have dividers berween the different categories and it's easy to add or remove a recipe or, to slide one out of the sleeve to add notes.Plus I can just wipe off any spills. After my mother-in-law passed away last year, all of her handwritten recipes were given to me (and there are tons!) I would like to scan them and then create a bound cookbook that I can print and share with her children and grandchildren as a keepsake. I wish I had some hands on experience to share that I've actually completed the project, but unfortunately I haven't had the chance to do so. Might be my New Years' resolution :) Thanks for sharing the strawberry pie recipe! It sounds so delicious! Kim, that's sound like a great project for the new year and what a wonderful keepsake it will be for family members! Scanning does sound like the way to go for me too. Lots of handwritten cards and notes, plus interesting measurements, make for some interesting outcomes. It was in part because of my role as keeper of our family recipes and stories that I was one of the last graduates of Miss Farmers School of Cooking that closed in '1977. I can look over at my collection of recipe boxes stuffed to the gills, 7 binders of clippings, and well over 100 cookbooks lovingly collected/ gifted to me over the years as we have become the matriarchs of the family. Speaking of scanning, I saw a wonderful link last week from the blog Beth Fish Reads to a site of scanned cookbooks. I have left my collection of books to the Schlessinger Library, and my heirs can squabble/ fight/ throw out the best cream cheese piecrust ( no fail but I can't make it well), the secret German Cheesecake recipe that only one person outside the family has, and my mother's corn fritter recipe. No one's probably going to want them..... these days, I save recipe links on Pinterest and Evernote....nuh?